Career pages are central to the recruiting process and they are particularly important in respect to HR marketing. While you likely have a career site, have you thought about it in terms of HR marketing? Your career page is the first impression that many potential applicants have of your company. It’s important to set-up your career page with these applicants in mind. It should clearly define your employer brand, and be authentic and convincing. Your career page should highlight you current job openings, as well as give candidates a feel for what life is like at your company. It is your opportunity to put a face to your company and help potential applicants to visualize a successful future as an employee. Need to see a best practice example? Check out Ryte's career site, where they include their open positions, photos of current employees, highlight their benefits, and share their company values. Talent pool's are the future of HR marketing. A talent pool is a database used for saving the information of interested individuals that have had a touch point with your company, for example through sourcing, at events, or from previous applications. It simplifies the recruiting process as a whole by creating a pipeline of qualified candidates for future openings. How can you use a talent pool for HR marketing? It provides the perfect opportunity for staying in touch with candidates and keeping them familiar with your employer brand. For example, you can send newsletters and nurturing emails to update them on current events and changes taking place at your company. And of course, send them relevant positions that they may be interested in. Looking for a best practice example? Check out our talent network page, as seen in the photo below. 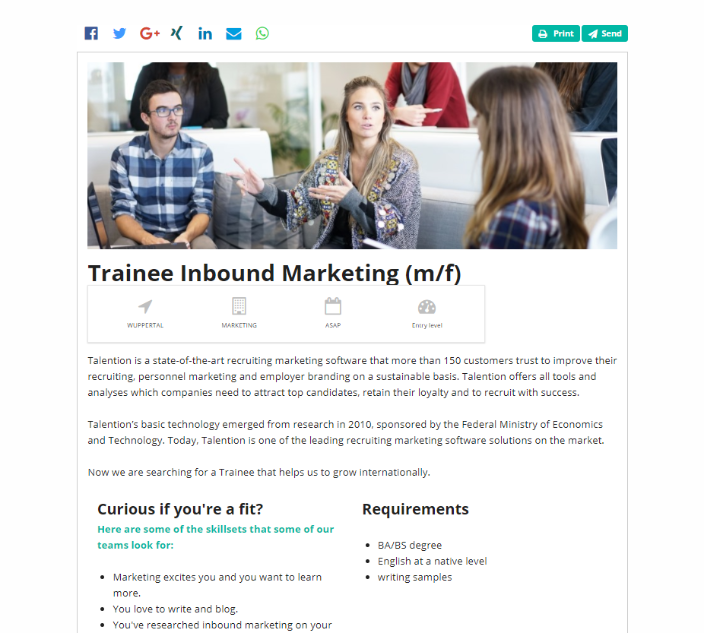 Last but not least, job advertisements are an important component of your HR marketing strategy. Job ads should cover the important aspects of the open position, as well as present an attractive view of your company. There are a couple of key points to consider when creating optimized job advertisements. First, you should consider what target group you are trying to reach. This will help you to determine how to write your ad correctly and where to place it. Next, conduct keyword research on the job title, making sure that it is relevant for your target group. Once you're ready to create the actual advertisement, make sure it is eye-catching and professional. It should give the candidate a sense of your company's employer brand. Finally, use the right channels to post your job advertisements. Make sure they are channels that are actually being used by your target group. And don't forget to try out some new channels as well. Check out our infographic on how to create a successful job advertisement here.